Monolopia congdonii. Credit David Magney. For more than 35 years, CNPS has been leading efforts to review and rank the rarity of California’s rare plants. This is an iterative and scientifically-vetted process made possible through a community of scientists and volunteers working throughout the state. This important data builds a foundation for the ongoing stewardship, appreciation, and conservation of California’s rare and endangered plant species. 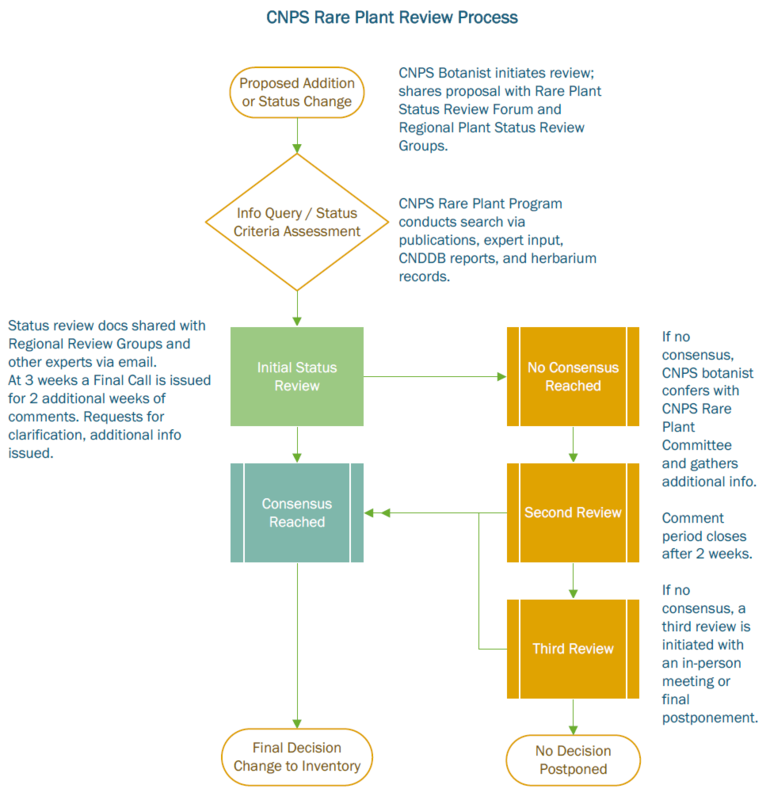 CNPS rare plant status review process flowchart. Major changes to the Inventory (i.e. additions, deletions, CNPS list changes, scientific name changes) are reviewed by CNPS, California Natural Diversity Database (CNDDB), regional Plant Status Review groups, and other experts. Once consensus is reached about a change, it is added to a group of pending changes, which are implemented on a quarterly basis (click on the accompanying figure for more detail). Chlorogalum purpureum reductum. Credit David Magney. CNPS solicits information about proposed changes to the CNPS Inventory as part of its review process. The CNPS Rare Plant Program encourages anyone who has knowledge about native plants, particularly rare plants, to contribute their comments/data as a Rare Plant Status Reviewer via the Rare Plant Status Review Forum. In order to join a Regional Plant Status Review Group and/or become a member of the Rare Plant Status Review Forum, please fill out and submit the Rare Plant Status Reviewer form to Aaron E. Sims (asims@cnps.org). If you feel you might qualify as a reviewer, but are not able to fill out and/or submit this form, please contact Aaron E. Sims (asims@cnps.org) for more information on how to become involved. Click on Rare Plant Status Review and select a taxon to review. Use the “Post Reply” button to share your comments/data. Please contact Aaron Sims at asims@cnps.org if you have any questions. The plant status review groups are divided into seven regions of the state (following those in The Jepson Manual). If you wish to be involved in a regional review group, please send an email to asims@cnps.org with your name, affiliation, and the name of the region in which you wish to participate. Central West (CW): Includes the central coast area of California, from Marin County in the north down through the south coast ranges, including much of Santa Barbara County in the south. East Side / Deserts (ES/D): Includes the east side of the Sierra Nevada Mountains from Mono County south through all of the Mojave and Sonoran deserts. Great Valley (GV): Includes all of the Sacramento and San Joaquin valleys. Modoc Plateau (MP): Includes all of the Modoc Plateau area of California. North West (NW): Includes all of northwestern California, from Sonoma and Napa counties in the south, north to the Oregon border, including the North Coast ranges, the Klamath Range, and the Cascades. Sierra Nevada (SN): Includes the Sierra Nevada range from Plumas County in the north to the Tehachapis in the south. South West (SW): Includes all of southwestern (non-desert) California, from coastal Santa Barbara County in the north to the Baja California border, including the Western Transverse and Peninsular ranges. See definitions for each plant rank level. Astragalus pycnostachyus lanosissimus, McGrath-lake. Credit David Magney.